With the flood of mobile, desktop and web apps facing consumers, the battle is increasingly turning to how to help users discover the right apps for them. Quixey, a new start-up backed by Eric Schmidt’s Innovation Endeavors, is throwing its hat into the ring of those looking to make the discovery process easier, by allowing users to simply say what they’re looking to do and then use that info to generate app recommendations for multiple platforms. The company just announced $400,000 in seed funding from Innovation Endeavors and Archimedes Ventures. Quixey, which is in private beta, bills itself as a “functional” search engine because it doesn’t require users to know an app’s name or provide a good description of an existing app. 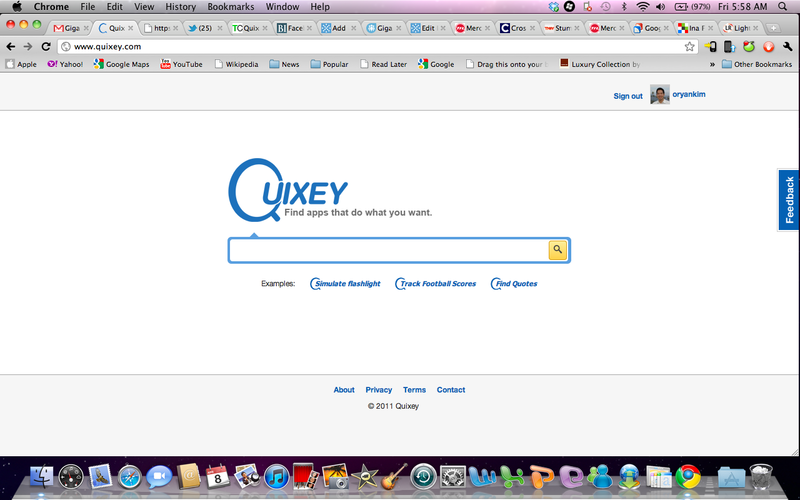 Users can write in actions they’re trying to do such as “mix music” or “find cheap gas” and Quixey pulls up a list of results for Android (s goog), iPad (s aapl) and iPhone as well as recommendations for Windows (s msft), Mac, Explorer, Firefox and the web. The results are still a work in progress. In trying it out, I found some queries worked relatively well, allowing me to use a more natural language approach to finding the appropriate app. It’s nice to see the results span so many platforms, too, because sometimes you just want to find the best way to handle a problem, no matter the device. But it still needs some fine tuning. When I asked, “give me local restaurant recommendations,” I got some good suggestions for Where and Hunch Local, but also one for a local guide for Cancun. A similar search, “get local recommendations,” pulled up a similar guide for Monterey, Calif.
Now to be sure, services such as Chomp and Appsfire can already pull up results for many user queries, though they’re not always set up to answer more specific action-oriented requests or longer queries like Quixey does. I expect that, over time, they will incorporate these types of search requests, which may undercut the value of Quixey down the line. But overall, it’s good to see more innovation in the app discovery space. There is still a disconnect for some people in getting to the apps that will help them the most. ComScore (s scor) reported that only 36.6 percent of smartphone users used apps in February, despite the fact there are hundreds of thousands available on iOS and Android. Apps stores and discovery engines are doing a good job in refining the process, taking a user’s existing app libraries to suggest recommendations. But there’s more work to be done to simplify the process of helping users find the right app that fits a specific need at the time. The Mountain View Calif.-based start-up, founded by Tomer Kagan and Liron Shapira, will officially debut at TechCrunch Disrupt in New York next month.